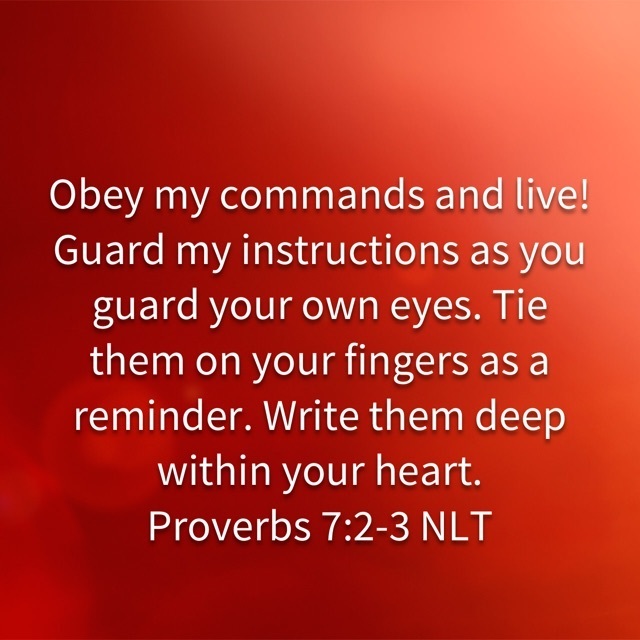 These verses made me think of my years in Awana and other church programs where I would memorize Scripture. I won pizza parties, swim parties, trophies, etc. It was fun as a kid and I do have to say, I memorized much better when I was younger. Even though I may not be able to quote exact "chapter and verse" I do remember enough to be able to find keywords and phrases and that has been so helpful. The Lord is truly faithful to bring His word to remembrance. This helps to bring peace to my mind or to share with a friend in time of need. Also, with today's technology, you can literally carry the entire Bible and many versions in your purse or pocket in various Bible apps. The app I use all the time is YouVersion. The app even can send notifications as a reminder to read the Scriptures, so no more "tieing them on your fingers as a reminder". The more time I spend reading God's word, the deeper He will write His truths on my heart.